Debt Records is proud to present the chance to witness the amazing T.E. Yates record brand new material with his band at the beautifully intimate Eagle Inn, Salford. The event takes place between 3pm and 10pm on Sunday 7th June. Come for the whole day or just drop in and out of the session at your leisure. It’s free entry and the beer on tap is good! Most musicians boast of exploding onto their local scene in a glittering blaze of media hype and spontaneous applause. T.E. Yates, however, snuck in through an open window. His name was not on the top line of event posters, but rather a discreet artist signature in the bottom corner; his first gig flyers and album covers were ones he designed for other bands not himself. He’s performed in front of huge crowds, but always as a hired hand or supporting player, a multi-instrumentalist in the shadows – mandolin, banjo, harmonica, even musical saw – you may have heard him on the tracks of other artists without even knowing it. But now T.E. 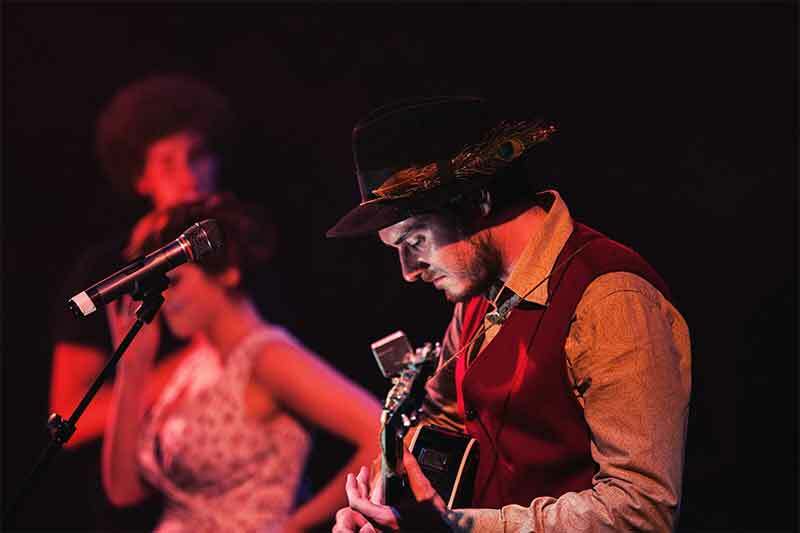 Yates has stepped out of the shadows, taking centre-stage with a formidable backing band (both onstage and on record) comprising members of Victorian Dad, The Bedlam Six, Ottersgear, Gorilla Riot and Honeyfeet. Even when performing solo the man doesn’t travel light – his weird and wonderful drawings regularly making an appearance between songs, baffling and delighting audiences in equal measures. His debut EP “Possessed” was released on Debt Records in 2013 and described by BBC Manchester’s Michelle Hussey as being “like Nick Drake’s Lazy Jane with a touch of Roy Orbison” and by I Am Kloot’s Pete Jobson as “euphoric”.